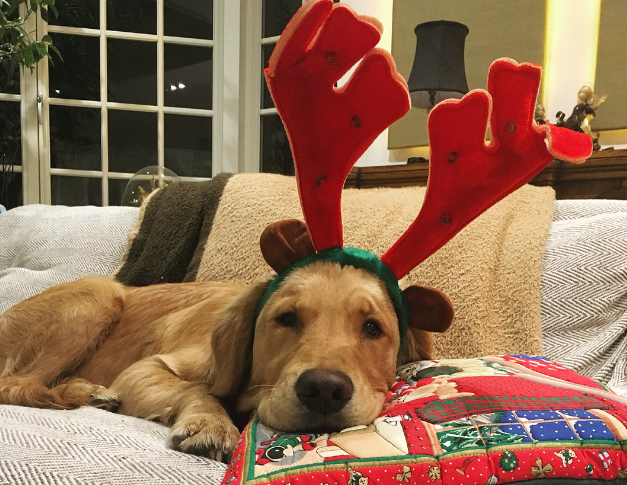 As Christmas draws closer, bringing with it excitement and a million and one things to do, it can be easy to forget that the festive period can be hazardous for our pets. Vet hospitals unfortunately see a spike in admittance for our furry friends this time of year. The most common reasons for a pet to visit the Vet on Christmas day are gastritis, foreign body ingestion, lacerations or bite wounds and chocolate poisoning. Treatments for these can be lengthy and costly. We’ve put together a list that Santa himself would approve of! Taking a few precautions can mean you’re entire family can enjoy a healthy and happy holiday season. 1. Christmas Lights – Twinkly lights create a magical atmosphere. But whenever you leave your pets unattended make sure the electrical cords are out of reach. If your dog or cat bites into them, it can result in burning sensations in their mouth. It can also cause seizures and fluid build-up in the lungs. Worst is that biting into wiring could lead to fire, putting not just your pet in danger, but your whole family. 2. Chocolate – This one we’re sure you’re aware of already for both dogs and cats. But with Christmas as an excuse for more sweet treat consumption, it’s easy to leave this toxic food lying around. Pooches are particularly attracted to the smell. As a general rule remember that the darker the chocolate, the more poisonous it is to your pet. 3. Christmas Trees – Our feline friends are particularly known for their curiosity in Christmas trees. If you’re a family who enjoys a real tree at Christmas, note that the pine needles are toxic and can puncture internal organs if eaten. Tree ornaments can also look like sparkly, fun new toys… Whether made of glass, plastic or wood, if ingested, they can cause lacerations to your pet’s mouth, throat and intestines. Hang them up high to avoid this problem. And lets not forget the importance of a solid base as your best mate could end up injured or severely hurt with a tree toppled over them! 4. Cooked Bones – While its tempting to give the dog the leftovers of the turkey, bones can cause an array of problems because of how brittle they are. Your pet may need surgery if pieces become stuck in the stomach or intestines or perforate the bowel. Uncooked bones can have the same effect so best to avoid bones altogether! 5. Tinsel – To your kitty tinsel can seem very appealing as it sparkles and dangles. If swallowed can cause digestive issues so keep out of reach! 6. Poinsettias – A favourite plant throughout the festive season but when ingested can cause poorly stomachs. 7. Mistletoe – Maybe you’ve hung some mistletoe above the door hoping for a Christmas kiss. But even when a small amount is swallowed by your pet, it can cause excessive drooling. It can also lead to diarrhea which no one wants to be cleaning up this Christmas! 8.Holly – This iconic Christmas plant contains mildly toxic substances but it’s the pointy leaves that can cause internal damage and severe stomach upset. 9. Mince Pies and Fruit Cake – Who doesn’t love a festive dessert? Keep the puddings to the pet parents though as these are often jammed packed with raisins, sultanas, currents and alcohol. The little fruits may seem harmless but can cause vomiting and even total kidney failure. And alcohol provokes the same sorts of reactions for pets as in humans, only much faster and with more dangerous results! 10. Liquid Potpourri – when we think about the holidays what springs to mind is the delicious array of smells. Liquid potpourri in particular poses a health hazard for your dog or cat, as it is likely to contain poisonous chemical substances. 11. Fatty Foods – Christmas meals often include lots of fatty items and while tempting to dish out the leftovers to your pet, excessively fatty foods like ham can cause inflammation of the pancreas. Pancreatitis is very painful and requires intensive care for the animals intestinal system to get back to normal. 12. House Vistors – As a busy time of year your home may feel somewhat out of the ordinary with guests coming and going. While some pets will love the extra attention others may find strangers and particularly young kids in their personal space stressful. You know your pet better than anyone else so if you feel like they are uncomfortable, offer up a quiet space for them to retreat to. If you think that your pet has been exposed to any of these risks then don’t hesitate to give your vet a call or take them in for a check up. Now that you have familiarised yourself with these hazards lurking in your home, you should now go and enjoy the festivities with your loved ones, pets and all!